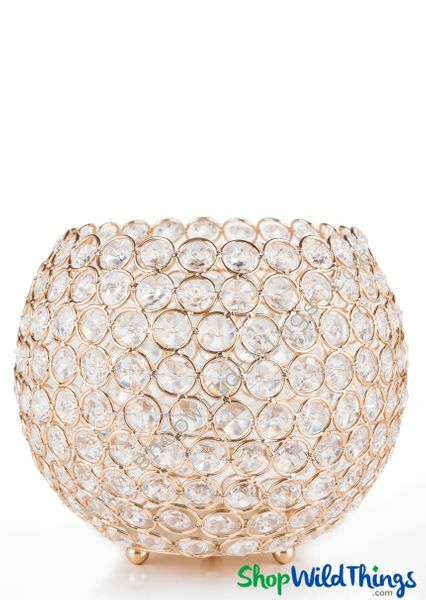 Home > Lighting > Candle Holders > Candle Holder - Real Beaded Crystal Ball Large - "Prestige" - 9 1/2" Gold - BUY MORE, SAVE MORE! 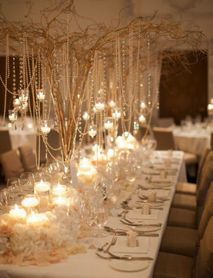 Do you need an awesome centerpiece but have no time to shop? Well, we gotcha covered! 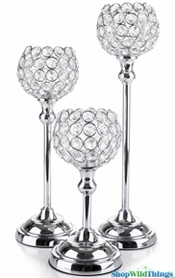 Our new Prestige Crystal Ball Candle Holder is a centerpiece all by itself! This Gold Candle Holder is 10" wide by 9 1/4" tall and it's loaded with magnificent, GENUINE crystal beads that have superb clarity. All the beads are faceted and the edges pick up the light and sparkle like crazy! Our crystal beads are real crystal, not acrylic and they are faceted on all sides. You will find sellers who "sneak" in plastic beads or mix acrylic with glass beads. We are fanatical that this is NOT done on our products. Candlelight is such an important part to setting the mood for events like weddings, anniversaries and special celebrations so combining your centerpiece designs with a candle holder is an obvious choice and wow, does that make it easy and stress-free. Win-win! This Crystal Ball weighs 3 lbs. and it sits on 3 feet, keeping it off the table surface and it comes with a removable votive cup that's 1 1/4" in diameter. Now that seems like a small cup for such a large candle holder, however, because our beads are so clear and pure, even a 2" tall flameless LED votive is sufficient to light this large candle holder. 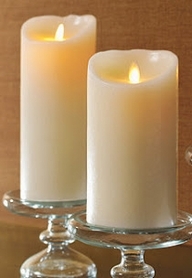 To add some flair, use a color changing votive and of course a pillar candle about 5" tall would work. Set this Crystal Ball on a mirror and add colored confetti or rose petals to the bottom along with a flameless Led to create a classy centerpiece or this can even be used as an accent piece for the floor. You'll truly be delighted at the show these dazzling beads produce! Our amazing line of Prestige Candle Holders, Cake Stands, Centerpiece Risers and Vases will complete the luxurious look and stress-free planning you've been yearning for! Please see the video below to see just why we're so proud of our Prestige line!